The wedding veil predates the importance of the wedding gown by hundreds of years. Each era and culture has revealed a different and beautiful way to cover the bride’s head. Ancient Chinese held a sacred umbrella over the bride’s head as protection. In Far Eastern countries, it was also commonly believed that the evil spirits were attracted to women, so they wore veils as protection. The custom continued for centuries and, in time, changed into a symbol of obedience, modesty, chastity, and submission. This custom persists in many cultures today. It is believed that the veil may have become used on the wedding day in other cultures to separate these evil spirits from the bride on her special day. The modern veil has evolved through the years as a response to both the economic and political climate. Elegant veils of lace and silk became popular for many years. During the 1940’s clothing materials were rationed and royal brides in England used less material in their gowns and veils. Where before veils had been long, they were now no more than shoulder length and attached to a Juliet cap or a hat. After World War II, with the advent of nylon, veils incorporated synthetics and took on a bouncy and full effect softly framing the bride’s face. 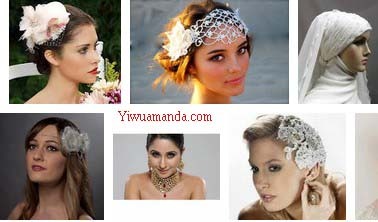 The bridal headpiece and wedding veil have become an important part of a bride’s attire in today’s weddings, each making a statement as individual as the bride wearing it.